Jonathan Prince Experiments with Jello! For the last several years, Jonathan Prince's work has explored the dialectical qualities of the physical states of matter and in particular, The Liquid State: the appearance of liquid fixed in a sculptural form, a body of work whose focus is that of materiality and physicality. 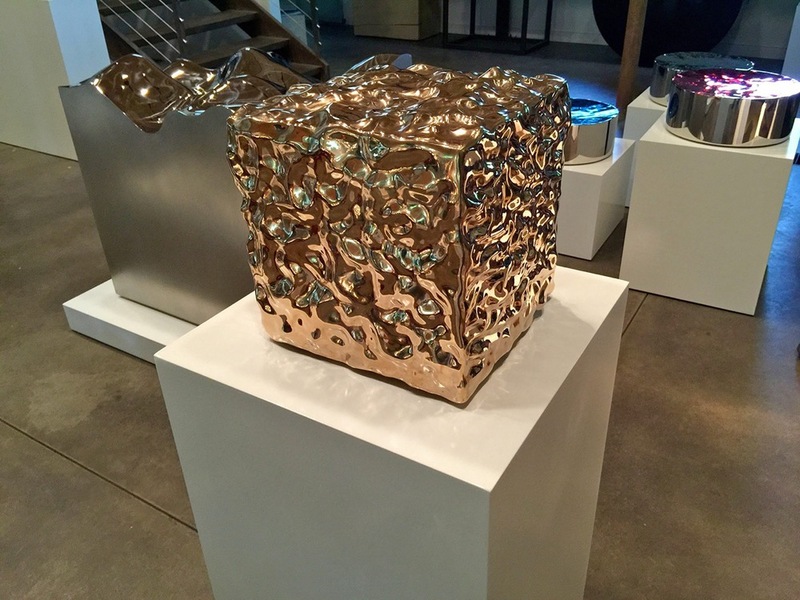 Prince has continually captured these elusive qualities through a variety of iterations of the cube and column, investigating the ways in which physical and chemical effects can disrupt and morph seemingly reliable, geometric forms. Prince's new Jello Cubes capture this concept most acutely and viscerally. The focus of the work has been to capture the variations of form as Jell-O congeals and is agitated by an external force, after which the lively material continues to move, or jiggle, on its own accord. Gels are mostly liquid in nature but behave as a semi-solid material, due to a 3-D cross-linked molecular network with the liquid. Prince’s past works have been engaged with the elusive fluidity of light, but it is the process of liquid becoming solid that interests him in this new body of work. While the nature of gelatin—its natural process of becoming a solid form from a liquid state—aligned with Prince’s conceptual interests, it also provides a playful contrast to the weight of his explorations. Jello-O, with its robust colors and flavors, is in direct opposition to the earthly, geological forms for which the artist is often associated. This juxtaposition creates an exciting tension and curiosity regarding the associations this post-war dessert evokes. While continuing to explore and expand the Liquid State series of sculpture, Turbulence Column is the first piece that investigates the ways in which physical effects of compression can disrupt and morph a seemingly reliable, geometric form. Jonathan Prince is pleased to share a new work entitled Bump Block for the ongoing series Liquid State. Bump Block reflects the progression of an idea conceived within the digital domain with it’s physical realization executed via a combination of the most advanced and ancient techniques of object creation. I investigated the idea of creating the work with a fully digital processes before deciding that the look and feel I envisioned for the piece could only be accomplished by a combination of techniques and hundreds of hours of finishing handwork. 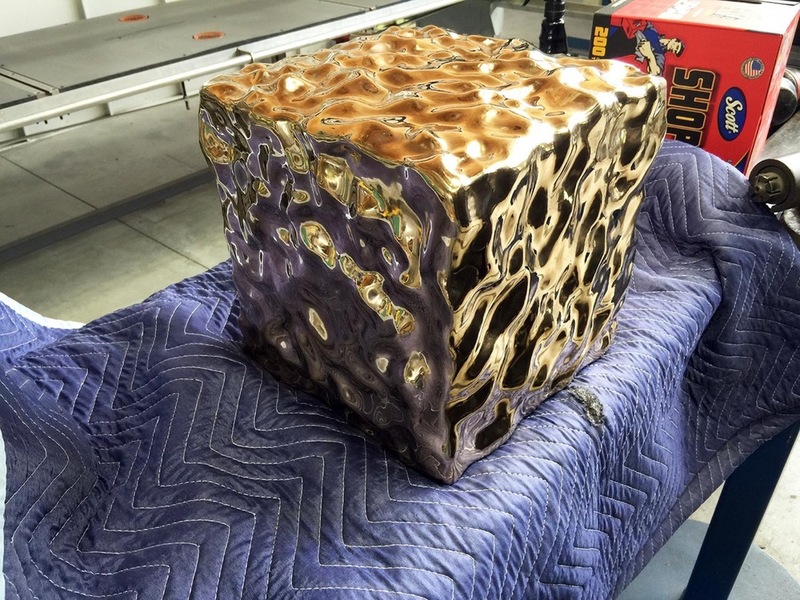 The concept was first rendered using 3-D modeling software; the initial build of the sculpture was completed in resin using SLA rapid prototype / 3D printing ; and then the traditional lost wax techniques to mould and cast the form were utilized in the completion of this silicon bronze sculpture. 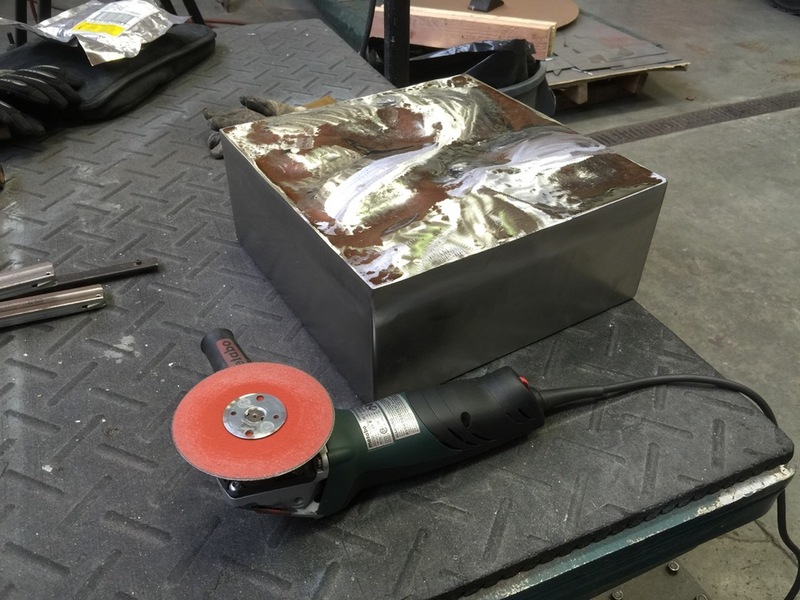 My desire in making Bump Block was to create a surface that I imagine to be a block of liquid metal - loosely holding its shape in a weightless environment - as if you took a cubical container of liquid with six removable sides in space and carefully removed each side leaving just the weightless liquid, the remaining form might resemble Bump Block. 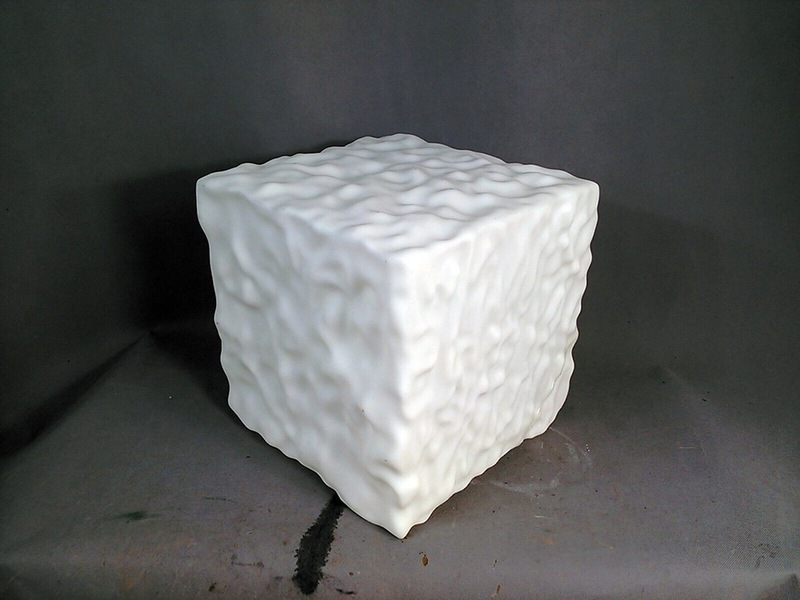 This sculpture is another example of a solid object that appears to have all the surface characteristics of a liquid with the effect of movement / vibration as light and ambient reflections flicker over its surface. Like many of my works, Cauldron oscillates in a state of duality: order and chaos, interior and exterior, dark and light, hidden and revealed. 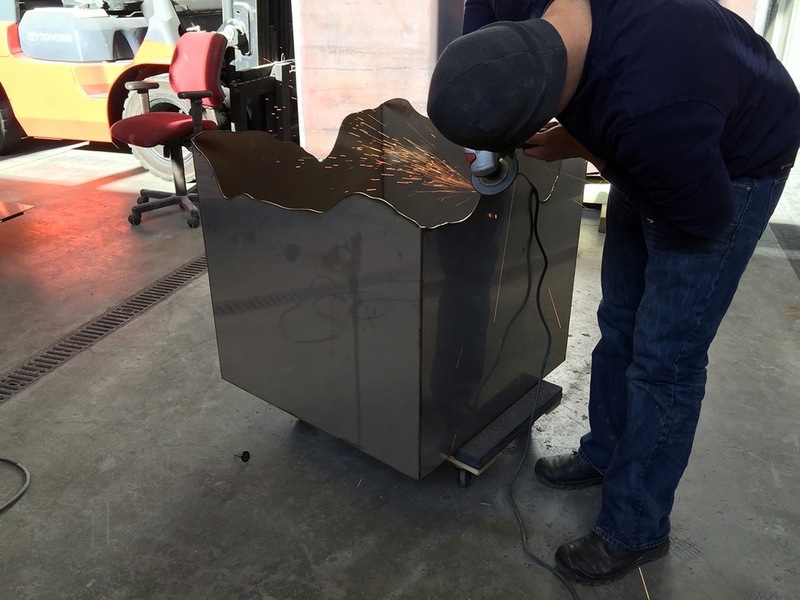 Cauldron's undulating inner surface pushes the fabrication of stainless steel to its limits. 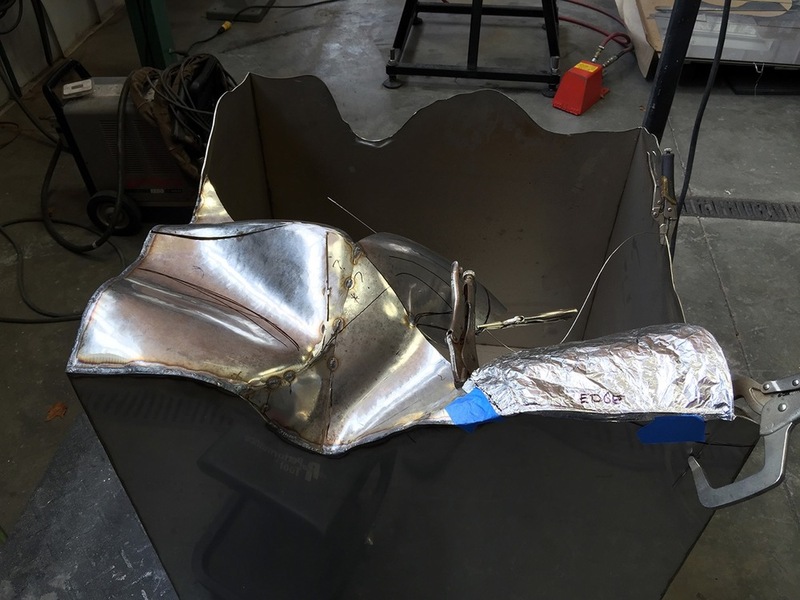 The result of this audacious task beckons the qualities of boiling liquid, of crashing waves in a violent storm, of mercury contained within a perfectly formed geometric vessel. I continually aim to reveal and make sense of the paradoxical characteristics of nature, and it is the lack of resolution that imbues my work with meaning, for it challenges concepts of beauty and reveals hidden value within the breaks of convention and expectation. The word cistern comes from the latin cista, which means box: a cistern is a waterproof container whose purpose is to hold liquid. 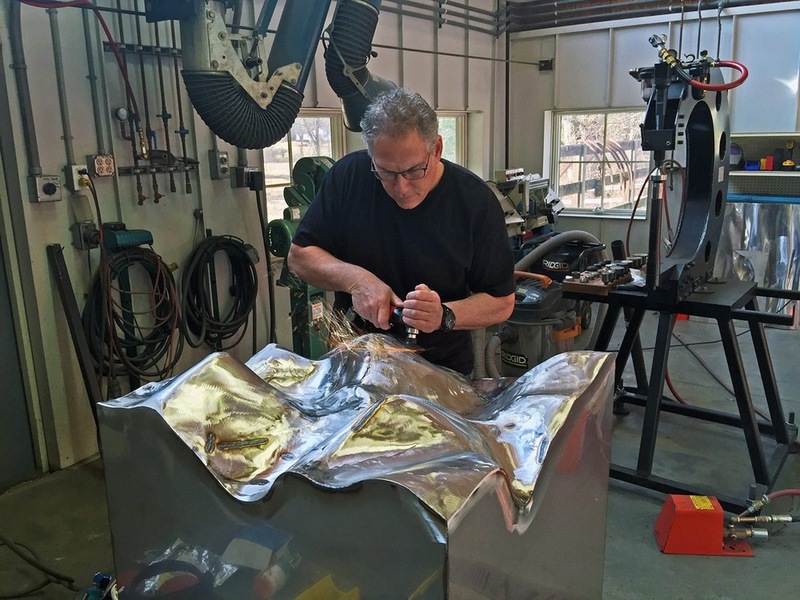 To perpetuate the concepts investigated in Liquid State - the illusion of fluid within a solid form - Jonathan Prince has manipulated stainless steel in a new way. In this sculpture, the geometry of the outer box, or cistern, appears to contain liquid as is its intended purpose. To engage the viewer further, Prince has experimented with both translucent and transparent color, as well as with the incorporation of holographic swirls created during the polishing process, thereby enhancing the illusion of liquid barely contained within solid geometry as if in a continuous state of becoming one or the other. 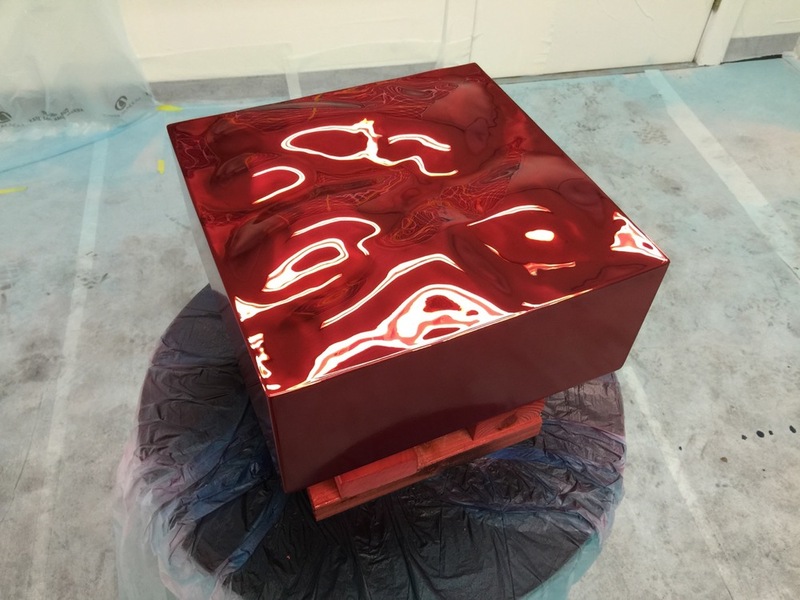 Jonathan Prince introduces a new sculpture for the Liquid State series entitled Ripple Cube 14. 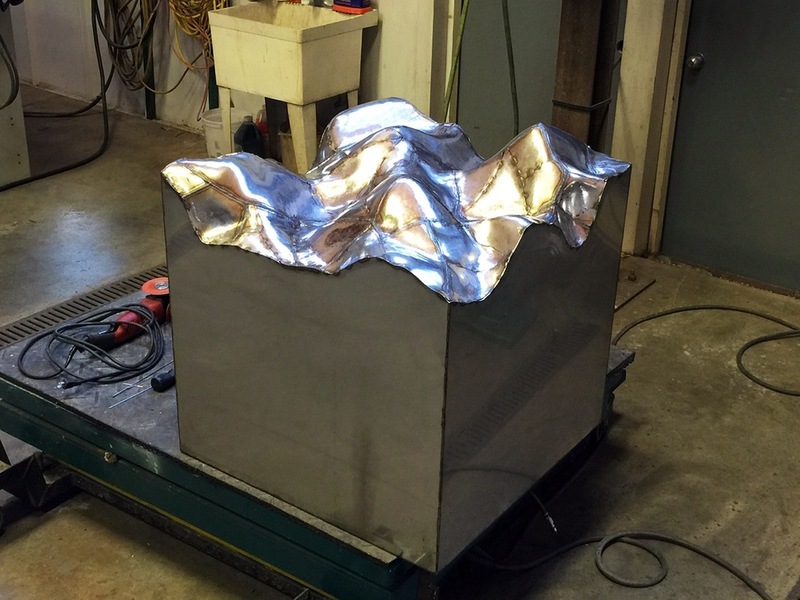 This work is rendered in high-chromium stainless steel and represents hours of surface work, a surface that emulates moving liquid upon a cubic landscape.